Explore. Learn. Grow. Master. Imagine... & LOVE MUSIC. Come & Discover the New Mozart in You! New Mozart School of Music is the largest music school in Palo Alto. We offer an unparalleled music lesson experience to our students and families. Our team of caring and experienced teachers give piano, violin, voice, cello, guitar, flute, and saxophone lessons to complete beginners to professional musicians every week. We've helped thousands of families in the Peninsula learn music over the years. We believe that learning music enriches lives, teaches perseverance, and most importantly, allows us to discover the joys of creating music. Go here to find out why more Palo Alto families choose us for music lessons. Thanks for visiting us here and let us know how we can help. One on one instruction is available for piano, violin, cello, flute, saxophone, guitar, and voice. Our private lessons run year round and you can join us anytime. 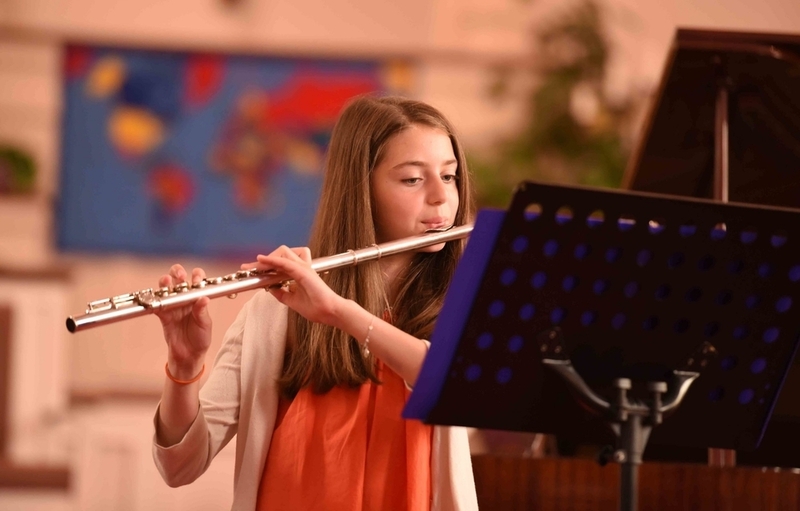 We have students learning just for fun and students who excel in Certificate of Merit, ABRSM, Guild, Carnegie Hall Achievement, ASTA, NATS exams & competitions. Our experienced and nurturing teachers have a proven track record of helping students reach their musical goals. New Mozart's Harmony Road program has been innovating how piano is taught to young children for over a decade. Our teachers are experienced early childhood music educators with piano/voice degrees who refined their skills at Juilliard, Mozarteum, & Princeton among others. Learn piano the way you learned how to walk, talk, and dance! Maya (age 5) proudly shows off her composition after her Saturday Harmony Road III class. The claim that public speaking tops death as the greatest human fear led Jerry Seinfeld to say, “So if you go to a funeral, you’re better off in the casket than giving the eulogy.” Now consider how much more terrifying the public performance of music must be - hundreds of eyes and ears trained on a single person as he or she makes a complex instrument speak in what amounts to a foreign language. A three-year-old child is a wonder to behold. She is a sponge for information, eyes wide open, hands grasping, ears attuned. It’s easy to feel that the main function of a parent is keeping inappropriate things out of reach. But there’s a positive side to this, of course. This is the age at which the child is most receptive to good things as well. Have you ever wanted to get inside the mind of your child’s music teacher? You’ve probably thought of your own job and how there are things that you would like to say but for one reason or another, you believe that it’s best to keep things unsaid. Discover the New Mozart in You!